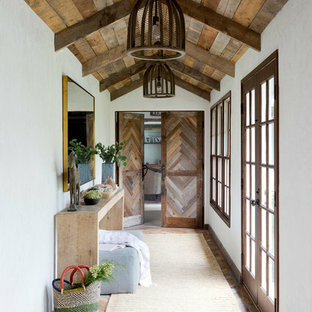 Looking for hallway ideas to spruce up your entrance or hall? There are a huge range of hallway ideas for your halls, landings and entryways that can make your in-between-room spaces feel more inviting. 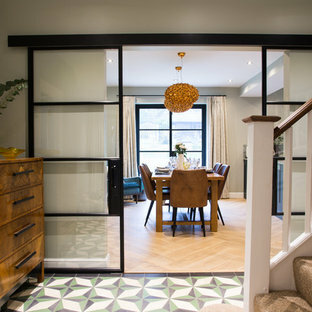 If you need hallway storage ideas, inspiration for hallway furniture, not sure what colours to go for, or you’re considering hallway wallpaper, then you can find all your inspiration from Houzz. Your hallway or hall is the place you usually enter and exit the house, meaning it’s usually the place you want to load up or unload all your outdoor items – coats, jackets, umbrellas, hats, shoes, scarves, and often bags and keys, too. However, narrow hallways are common in a lot of UK and Irish properties so hallway storage can sometimes be hard to achieve. 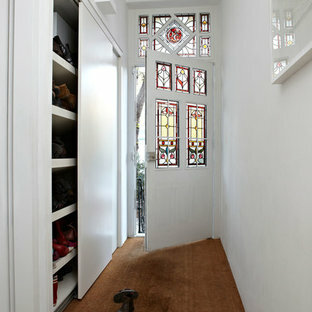 The type of hallway storage ideas that would suit your home will always depend on the available space and flexibility you have in your space – if feasible, built-in storage like cupboards and under-stairs storage will really help, but if not, there’s hallway furniture, hooks, racks and rails that can come to the rescue. Where space permits, furniture that doubles as storage is a great idea. A hallway storage bench, such as a monks bench, is an ideal multi-functioning solution while console tables were made for narrow hallways and provide concealed storage for clutter and a handy surface for decorative items. If you have an empty corner, a shelving unit or cabinet with cupboard compartments could use up the wasted space while providing much needed storage. Traditional hallway furniture includes coat stands, shoe storage and wall hooks, but you could save space by finding a piece that has all three combined – coat and shoe racks or ‘hall trees’ often have benches, shoe compartments and coat hooks all in one slender piece of furniture. 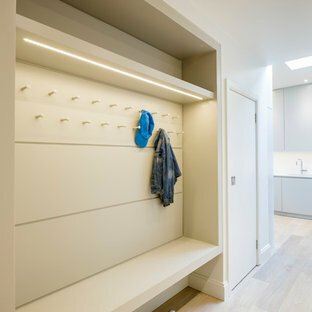 You can obviously make use of hallway ideas such as hooks, shelves and rails, as well, for storage for coats, bags, umbrellas and even bikes where you don’t have outdoor storage. Halls, hallways and entrance spaces are usually the first space to be seen when someone enters the house, and first impressions count, so it’s no wonder there are tons of great hallway decorating ideas to help you make this area of your house impressive. While you might feel that slim spaces like hallways and landings are hard to decorate, there are actually plenty of narrow hallway ideas that can bring life to your walls, floors and ceilings. Because of their layout, walls can be the best feature of a hallway and offer the perfect opportunity for wall art, though anything too elaborate may be wasted for lack of room to stand back and admire. Instead, a picture wall with a collection of framed photographs or prints can make a lovely feature, as can adding wall decor such as clocks, hanging plants, prints or posters for decorative details that are easy to change. Hallway wallpaper is making a big comeback as it’s another way to add lots of character, colour and style to a small space like a hall or landing. You could choose a vibrant pattern; a rich coloured wallpaper to contrast against light furniture and flooring (or vice versa); a subtle, understated hallway wallpaper to give an elegant feel; or choose a feature piece for one wall. The type of hallway wallpaper you choose should obviously depend on your style and taste, but also consider the flooring and other features – will you have a tiled floor, wooden hallway flooring, carpet or a hallway runner? And which hall colours should you go for? While ‘light and bright’ is a good rule of thumb when it comes to narrow hallway decorating ideas, rich hues such as greens, blues, reds and purples can also work as hallway ideas, and can even look stunning in larger spaces and period homes. Hallway lighting is an important tool to balance proportions and enhance brightness in a hall, and strategically-placed hallway mirrors, such as at the bottom of the staircase, will make the the space seem wider. 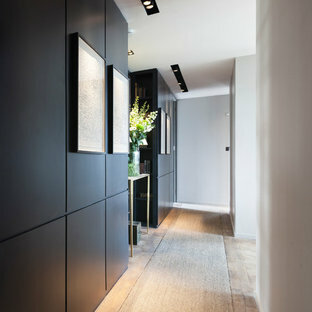 You can find more hallway lighting ideas on Houzz if you’re struggling with a dark hallway. Although hallway furniture is often for storage purposes, it doesn’t have to be. Utilising hallway corners is a great way to add dimension and cosiness to your hallway, and can make an unexpectedly welcoming area for relaxation. If yours is big enough, it can be furnished with seating such as a hallway bench, armchair, rocking chair or beanbag; you could add a small table, lamps, hallway storage boxes, ottoman or bookcase (or all of the above!) 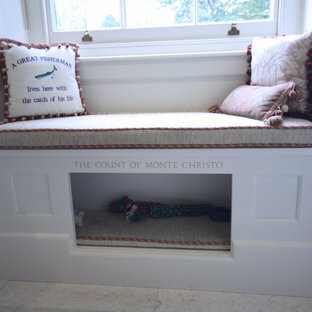 to create a comfortable nook for reading, listening to music, or just passing the time. 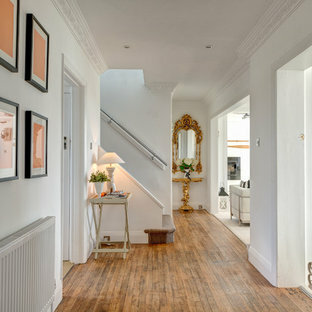 Check out the hallway products available to buy on Houzz to stylishly update your hall or landing area. 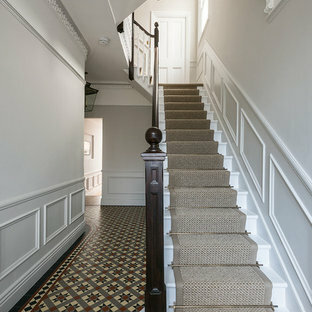 The landing at the top of your staircase is too often a neglected but can provide valuable, flexible, additional space. The golden rule of furnishing landings is to ensure stairways aren’t impeded, but even with limited floor space this is an area that affords ample opportunity for furniture and design. Some landings may have enough room for furniture such as seating or bookshelves to create a quiet reading area, or a desk and shelving to provide a makeshift work space. 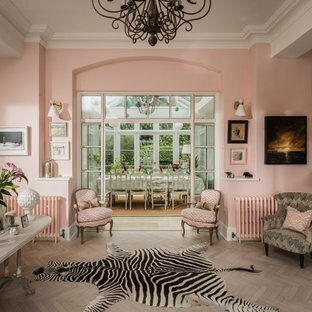 Even if your landing is on the smaller side, use landing ideas such as a small hall table or stool accessorised with a table lamp, an antique bowl or flowers, which will add interest. A beautiful window seat can be the prize feature of a house, so if you have a bay window on your landing it seems a crying shame not to make the most of it. For a built-in option, seating with added storage can be installed under the window; alternatively, simply placing a bench, miniature sofa or chaise longue in the window will add charm to your landing. With more and more people finding themselves short on space, this storage bench goes where others can’t without sacrificing style. Choose from a huge range of plain and patterned fabrics to complement your colour scheme. You can choose from our standard paint and upholstery ranges for a co-ordinated finish, and from our knob and handle range for a unique touch. 3 door bespoke oak veneered folding door set with clear glass. Custom stain finish to match flooring. 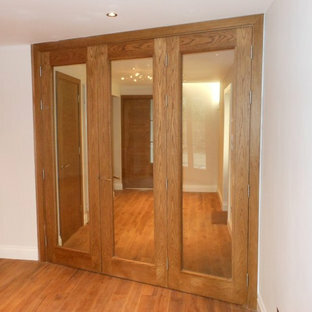 Plain internal oak doors with the same finish, visible in the background. Brandon Barre Photography *won Best of Houzz" 2013- 2019 and counting.